All the sabudana lovers out here take a look at this simple, healthy sabudana wada recipe. 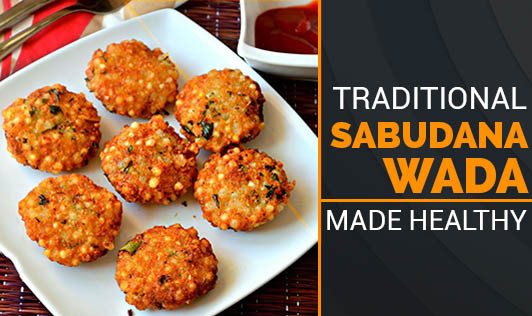 Now make your fasts delicious and low calorie with a small twist to your traditional sabudana wada recipe. • Pressure cook or boil potatoes, mash and keep aside. • Add sabudana to a pressure cooker and steam for 1 whistle and allow it to cool. • Combine the mashed potatoes, green chilies, sabudana, curry leaves, salt, and jeera powder together and divide the mixture into 8 to 10 equal parts. • Now take an "Appe making mould" and brush with a little ghee. • Place the wadas in the appe moulds and steam them on medium flame. • Keep turning them in between, till they turn light brown on both sides. • Take care to not overcook them. • Serve hot with green chutney or dahi.